You play as one of a whole bunch of characters, all of them shout-outs to various movies like Terminator, Robocop, Escape from New York and Indiana Jones and all of them equipped with their own, unique weapons, ranging from a simple bullwhip to Gatling guns so ridiculously powerful their recoil will make you move faster than enemy trucks do. Your goal is to reach the enemies’ headquarters at the end of the level, killing the bad guy and being airlifted out of the hot zone. The way in between the start and the goal is filled with destructible terrain, explosive barrels (because any game should have explosive barrels), gas tanks, AK47-wielding enemies, minefields, rocket artillery and mechas. No, really. 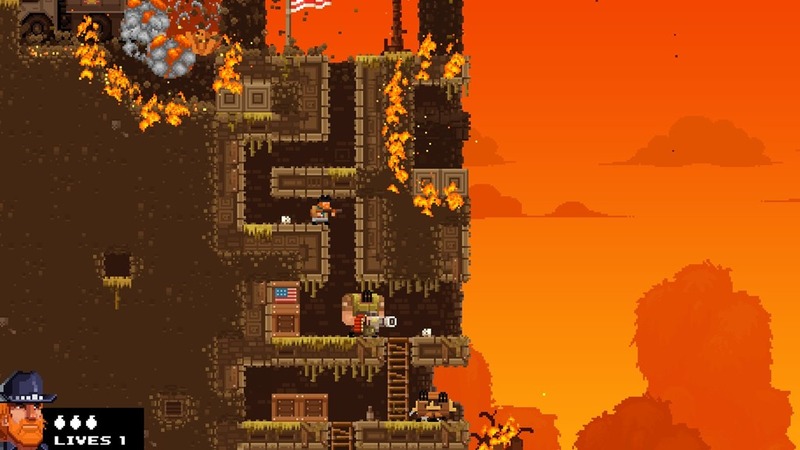 There are mechas in Broforce’s rendition of Vietnam. Once you cling to the chopper taking you away from the big explosions, fireworks fly up and electric guitars start to shred. It’s so over-the-top, it’s completely hilarious even in single-player mode. The pacing of the game feels great: A single hit will usually kill you, so you need to keep moving, fast, and rely on the element of surprise. The level design usually requires at least a bit of thought before you can start blowing baddies to bits, and the difficulty curve is steep enough to keep things challenging – a bit too challenging for my taste, a bit more learning time would be great. But, well, it is Early Access, and more content on lower difficulties might come along later. Moving around enemies, or blowing them up with strategically-placed gas tanks, or shooting away the ground under their feet is often a better alternative to simply going in guns blazing and getting yourself killed, especially with the stronger enemies like the aforementioned mechas. It’s your choice if you want to spend 15 bucks on this game in Early Access, but it is definitely worth keeping an eye on.